MSOE's history is rich and far reaching. 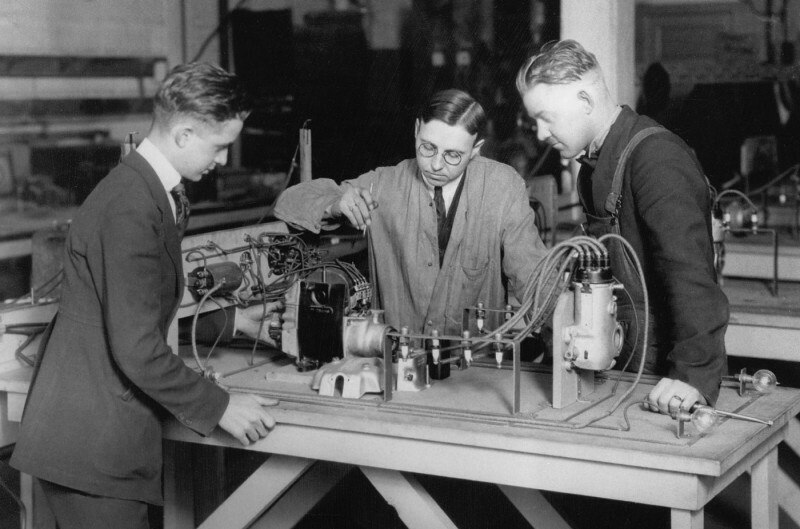 At the dawn of the 20th century, new occupations emerged in technical fields as the use of electrical and mechanical power was greatly accelerated. Engineers and technicians were in great demand, but few people were available who had the formal education and technical training. Industry’s need spurred the development of progressive programs of technical education. In this context, Oscar Werwath organized the School of Engineering of Milwaukee in 1903. Werwath was a practicing engineer who graduated from European technical schools in the late 19th century. He was the first person to plan an American educational institution based on an applications-oriented curriculum. From the beginning, leaders of business and industry cooperated in the institution’s development, and a close relationship was established that has continued throughout MSOE’s history. These early supporters realized that their future depended upon educational institutions that could prepare men and women to fill newly created engineering and management positions. Today, MSOE offers 17 bachelor’s degrees and 11 master’s degrees. The 2,900 students who attend MSOE come from all parts of the United States and dozens of other countries. More than 20,000 alumni live and work throughout the United States and abroad, and nearly 2,000 of them own their own businesses or are officers of companies. MSOE is a small university making an enormous impact. Dr. John Y. Walz began his term as MSOE’s fifth president on July 1, 2016. Dr. Matthew Panhans, professor and former chair of MSOE’s Mechanical Engineering Department, served as interim president until Walz was appointed.